What gets scientists so excited about the potential of quantum computers is the ability of multiple quantum bits – or qubits – to exhibit what is called ‘quantum entanglement’. Entanglement has been likened, by Caltech’s John Preskill, to a bizarre book, in which “the information isn't written on the pages. It's stored in the correlations among the pages, so you have to somehow read all of them at once”. It describes the interaction of spins of a qubit: although it may not be known which way the two spins are pointing (between 0 or 1), it is known that they point in opposite directions. Once entangled, the spins remain in this state no matter how far apart they are (even the distance to an orbiting satellite) when measured again. “Gaining access to these entangled quantum states is the key to exploiting the exponentially large computational power of quantum systems,” says Professor Andrea Morello of UNSW in his explainer video. “In the context of quantum computing, entangled states represent a strikingly non-classical computer code. There is no way you can write in your desktop computer a code where two bits have no value but have the opposite value, but you can do so in a quantum computer and the more qubits you have, the more these entangled quantum computer codes proliferate and grow exponentially with the number of qubits,” he adds. Capturing what Einstein described as “spooky action at a distance” in a practical quantum computer is incredibly difficult. In practice, entangled states are extremely fragile, and easily broken down by interference from the outside world. Now researchers at UNSW have achieved a “major milestone” in the engineering effort around entanglement, by producing a silicon chip with two interacting qubits. “It was fascinating to watch. 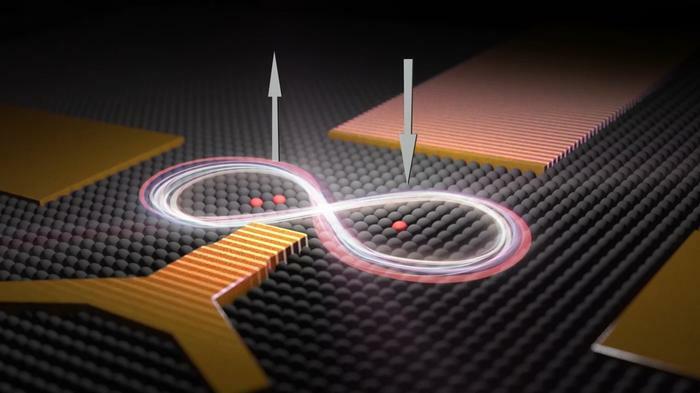 When the spin of one electron is pointing up, the other points down, and vice versa,” study lead co-author, Dr Matthew Broome, formerly of UNSW and now at the University of Copenhagen. An artist's impression of two qubits - one made of two phosphorus atoms and one made of a single phosphorus atom - placed 16 nanometres apart in a silicon chip. UNSW scientists were able to control the interactions between the two qubits so the quantum spins of their electrons became correlated. When the spin of one electron is pointing up, the other points down. 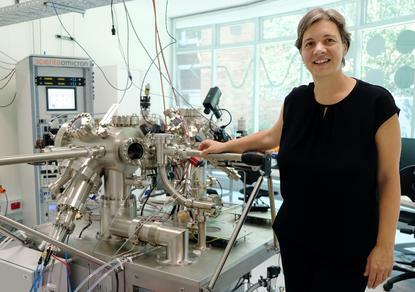 The team at UNSW – led by UNSW Professor Michelle Simmons, Director of the Centre of Excellence for Quantum Computation and Communication Technology, or CQC2T – create their qubits by precision placing single phosphorous atoms in silicon and using the electron spin on that phosphorous atom as the qubit. The method shows great promise for future qubits as they have demonstrated extremely long relaxation and dephasing times (at least in quantum terms, actually around 30 seconds). 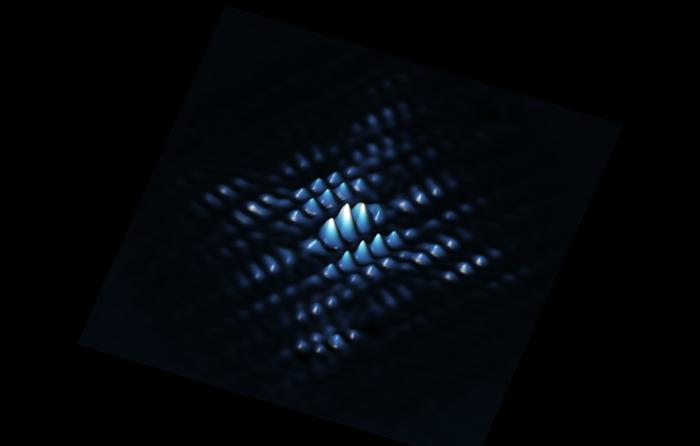 “In placing our phosphorus atoms in the silicon to make a qubit, we have demonstrated that we can use a scanning probe to directly measure the atom’s wave function, which tells us its exact physical location in the chip. We are the only group in the world who can actually see where our qubits are,” said Simmons, the recipient of the 2018 Australian of the Year award. In their most recent study, published this week in Nature Communications, the team placed two qubits – one made of two phosphorus atoms and one made of a single phosphorus atom – 16 nanometres apart in a silicon chip. Using electrodes patterned onto the chip, the interactions between the neighbouring qubits could be controlled, Broome explains, “so the quantum spins of their electrons became correlated”. A major challenge in building multiple qubit chips was understanding how close qubits need to be to interact with each other and perform readout on. Theory had predicted the qubits would need to be placed 20 nanometres aparts to see the correlation effect, but was found to occur at only 16 nanometres apart. The study is the latest in a number of advances being made by the UNSW team as they race towards building a functioning quantum computer in silicon. They are pursuing a silicon approach because it is among the most stable and easily manufactured environments in which to host qubits, they say, and its long history of use in the conventional computer industry means there is a vast body of knowledge about this material. Their approach has gained the interest and funding of the likes of Commonwealth Bank of Australia and Telstra, and state and federal governments. Last year, Simmons and her team established Australia's first quantum computing hardware company – Silicon Quantum Computing – which is working to develop and commercialise a 10-qubit demonstration device in silicon by 2022, which will serve as a "forerunner to a silicon-based quantum computer" the company said.